"William Rufus" redirects here. See also William Rufus Day. 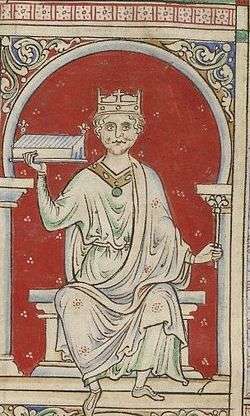 William II (Old Norman: Williame II; c. 1056 – 2 August 1100), the third son of William I of England, was King of England from 1087 until 1100, with powers over Normandy, and influence in Scotland. He was less successful in extending control into Wales. William is commonly known as William Rufus or William the Red, perhaps because of his red-faced appearance. He was a figure of complex temperament: capable of both bellicosity and flamboyance. He did not marry, nor did he produce any offspring, legitimate or otherwise. He died after being struck by an arrow while hunting, under circumstances that remain murky. Circumstantial evidence in the behaviour of those around him raise strong but unproven suspicions of murder. His younger brother Henry hurriedly succeeded him as king. William's exact date of birth is unknown, but it was some time between the years 1056 and 1060. He was the third of four sons born to William the Conqueror and Matilda of Flanders, the eldest being Robert Curthose, the second Richard, and the youngest Henry. William succeeded to the throne of England on his father's death in 1087, but Robert inherited Normandy. Richard had died around 1075 while hunting in the New Forest. The division of William the Conqueror's lands into two parts presented a dilemma for those nobles who held land on both sides of the English Channel. Since the younger William and his brother Robert were natural rivals, these nobles worried that they could not hope to please both of their lords, and thus ran the risk of losing the favour of one ruler or the other, or both. The only solution, as they saw it, was to unite England and Normandy once more under one ruler. The pursuit of this aim led them to revolt against William in favour of Robert in the Rebellion of 1088, under the leadership of the powerful Bishop Odo of Bayeux, who was a half-brother of William the Conqueror. As Robert failed to appear in England to rally his supporters, William won the support of the English with silver and promises of better government, and defeated the rebellion, thus securing his authority. In 1091 he invaded Normandy, crushing Robert's forces and forcing him to cede a portion of his lands. The two made up their differences and William agreed to help Robert recover lands lost to France, notably Le Maine. This plan was later abandoned, but William continued to pursue a ferociously warlike defence of his French possessions and interests to the end of his life, exemplified by his response to the attempt by Elias de la Flèche, Count of Maine, to take Le Mans in 1099. William Rufus was thus secure in what was then the most powerful kingdom in Europe, given the contemporary eclipse of the Salian emperors. As in Normandy, his bishops and abbots were bound to him by feudal obligations; and his right of investiture in the Norman tradition prevailed within his kingdom, during the age of the Investiture Controversy that brought excommunication upon the Salian Emperor Henry IV. Anglo-Norman royal institutions reached an efficiency previously unknown in medieval Europe, and the king's personal power, through an effective and loyal chancery, penetrated to the local level to an extent unmatched in France. Without the Capetians' ideological trappings of an anointed monarchy forever entangled with the hierarchy of the Church, the king's administration and law unified the realm, rendering him relatively impervious to papal condemnation. However, this conflict was symptomatic of medieval English politics, as exemplified by the murder of Thomas Becket during the reign of the later Plantagenet king Henry II (his great-nephew through his brother Henry) and Henry VIII's actions centuries later, and as such should not be seen as a defect of William II's reign in particular. [lower-alpha 2] Of course, contemporary churchmen were themselves not above engaging in such politics: it is reported that, when Archbishop Lanfranc suggested to William I that he imprison the rebellious bishop Odo of Bayeux, he exclaimed "What! he is a clergyman". Lanfranc retorted that "you will not seize the bishop of Bayeux, but confine the earl of Kent": Odo was both bishop of Bayeux, and earl of Kent. Also, while there are complaints of contemporaries regarding William II's personal behaviour, he was instrumental in assisting the foundation of Bermondsey Abbey, endowing it with the manor of Bermondsey; and it is reported that his "customary oath" was "By the Face at Lucca! "[lower-alpha 3] It seems reasonable to suppose that such details are indicative of William II's personal beliefs. William Rufus inherited the Anglo-Norman settlement detailed in the Domesday Book, a survey undertaken at his father's command, essentially for the purposes of taxation, which could not have been undertaken anywhere else in Europe at that time, and is a sign of the control of the English monarchy. If he was less effective than his father in containing the Norman lords' propensity for rebellion and violence, through charisma, or political skills, he was forceful in overcoming the consequences. In 1095, Robert de Mowbray, the earl of Northumbria, refused to attend the Curia Regis, the thrice-annual court where the King announced his governmental decisions to the great lords. William led an army against Robert and defeated him. Robert was dispossessed and imprisoned, and another noble, William of Eu, accused of treachery, was blinded and castrated. In external affairs, William had some successes. In 1091 he repulsed an invasion by King Malcolm III of Scotland, forcing Malcolm to pay homage. In 1092 he built Carlisle Castle, taking control of Cumberland and Westmoreland, which had previously been claimed by the Scots. Subsequently, the two kings quarrelled over Malcolm's possessions in England, and Malcolm again invaded, ravaging Northumbria. At the Battle of Alnwick, on 13 November 1093, Malcolm was ambushed by Norman forces led by Robert de Mowbray. Malcolm and his son Edward were killed and Malcolm III's brother Donald seized the throne. William supported Malcolm's son Duncan II, who held power for a short time, and then another of Malcolm's sons, Edgar. Edgar conquered Lothian in 1094 and eventually removed Donald in 1097 with William's aid in a campaign led by Edgar Ætheling. Edgar recognised William's authority over Lothian and attended William's court. William made two forays into Wales in 1097. Nothing decisive was achieved, but a series of castles were constructed as a marchland defensive barrier. To the chroniclers – men of the Church – such an "act of God" was a just end for a wicked king, and was regarded as a fitting demise for a ruler who came into conflict with the religious orders to which they belonged. Over the following centuries, the obvious suggestion that one of William's enemies may have had a hand in this event has repeatedly been made: chroniclers of the time point out themselves that Tirel was renowned as a keen bowman, and thus was unlikely to have loosed such an impetuous shot. Moreover, Bartlett says that rivalry between brothers was the pattern of political conflict in this period. William's brother Henry was among the hunting party that day and succeeded him as King. Modern scholars have reopened the question, and some have found the assassination theory credible or compelling, but the theory is not universally accepted. Barlow says that accidents were common and there is not enough hard evidence to prove murder. Bartlett notes that hunting was dangerous. Poole says the facts "look ugly" and "seem to suggest a plot." John Gillingham points out that if Henry had planned to murder his brother it would have been within his interests to wait until a later time. 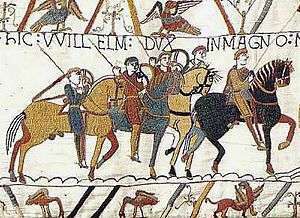 It looked as though there would soon be a war between William and his elder brother Robert, which would result in one of them being eliminated, thus opening the way for Henry to acquire both England and Normandy through a single assassination. Tirel fled immediately. Henry had the most to gain by his brother's death. Indeed, Henry's actions "seem to be premeditated: wholly disregarding his dead brother, he rode straight for Winchester, seized the treasury (always the first act of a usurping king), and the next day had himself elected." 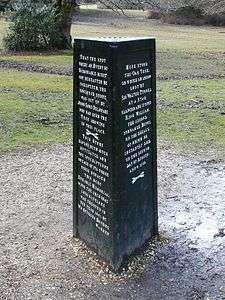 Wikimedia Commons has media related to Rufus Stone. King William the Second, surnamed Rufus, being slain, as before related, was laid in a cart, belonging to one Purkis[lower-alpha 4] and drawn from hence, to Winchester, and buried in the Cathedral Church, of that city. ↑ Barlow suggests that William and Henry probably urinated over Robert. ↑ According to Eadmer, an unusually well placed witness, William II "protested that Archbishop Anselm of Canterbury could not possibly keep at the same time both the allegiance which he owed to the King and obedience to the Apostolic See against the King's will." Anselm found himself in similar conflict with William II's successor, Henry I, as also reported by Eadmer. ↑ For an interesting discussion of such blasphemous oaths, see Barlow, F., William Rufus, Univ. of California Press, 1983, pp. 116–8. An alternative, pagan interpretation of this oath proposed by Margaret Murray is that William II swore by the "face of Loki": Murray, Margaret A., The God of the Witches, OUP, 1970, p. 164. ↑ Philip J. Potter, Gothic Kings of Britain: The Lives of 31 Medieval Rulers, 1016-1399 (2009), p.47. ↑ Gillingham, John (2015). William II: The Red King. Allen Lane. p. 97. ↑ Chambers, Robert (1832). The Book of Days: A Miscellany of Popular Antiquities in Connection with the Calendar, Including Anecdote, Biography, & History, Curiosities of Literature and Oddities of Human Life and Character, Volume 2. London: W. & R. Chambers Limited. Retrieved 7 January 2016. ↑ Lloyd, Arthur (2000). The Death of Rufus. The New Forest Ninth Centenary trust. pp. 19–20. ISBN 0-9526120-5-4. ↑ Lloyd, Arthur (2000). The Death of Rufus. The New Forest Ninth Centenary trust. pp. 11–12. ISBN 0-9526120-5-4. ↑ "Royal connections". Winchester Cathedral website. Dean and Chapter of Winchester Cathedral. 2011. Retrieved 2011-03-22. 1 2 3 4 5 6 7 Lloyd, Arthur (2000). The Death of Rufus. The New Forest Ninth Centenary trust. pp. 22–26. ISBN 0-9526120-5-4. Garmonsway, G.N. (editor) (1972). The Anglo-Saxon Chronicle. Dent, UK: Dutton.